Join in tonight for the launch of ALICE at Temperley London. 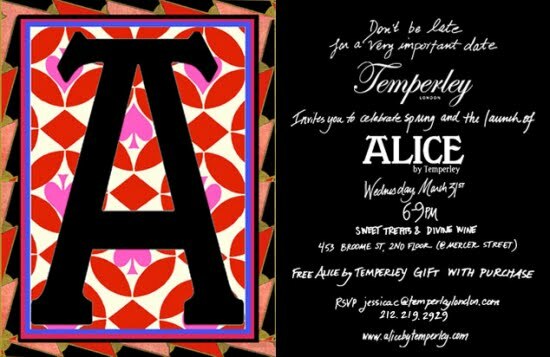 RSVP at: jessicac@temperleylondon.com. When: 3.31.2010 from 6pm to 9pm. The Johnnie Walker "Lab" for the tasting! Johnnie Walker is not all about the Black Label. There is also the Red label, the Gold. And the Green and the Blue. In this variety of colored labels, you would maybe wonder which of all is the best. Well, it’s all personal. The Black Label is the most famous of all JW labels. It takes up to 12 years to make and it brings aromas of citrus, caramel and smokiness. At the end you may even taste vanilla and if you add water the smoke will become even deeper. The Red label is that of peppers and spices, has more flavor, and combines the sweet and spicy of chillies. The Gold label is served iced, in an iced glass straight from the freezer. You can smell and taste honey and raisins, with a bit of smokiness at the end. The Green Label is lesser known but it says the story of Scotland, that’s why is very important. It combines 35 single malts and has elements of grassiness, chocolate, light freshness and fruit. Finally, the Blue Label, is creamy, floral and with a tad of perfume. It tastes tobacco, chocolate and rose petals. 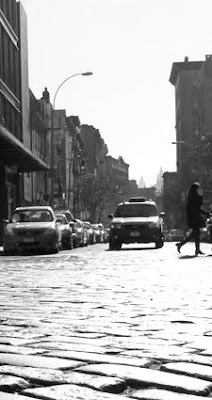 On Saturday, March 27, W magazine will bring its unique take on chic to the Meatpacking District with in-store events, appearances by W editors & experts and special offers at over 40 retail destinations. Check out the Shop W Style Lounge at The Standard, New York to pick up a map of events, check out the new Kate Moss for Longchamp Collection, enjoy a make-up application by Shiseido and be among the first to shop the new Tacori 18k925 collection. Plus, sign up for a stylist-on-demand appointment and private style sessions at HUGO BOSS. When: Saturday 3.27, 10am to 6pm. The 3rd Annual Village Voice culinary event, the Choice Eats was held on Monday night. As a first timer to the event, I didn't know what to expect so I got organized before hand: I checked the participating restaurants, I made a list of those I would definitely try and crossed those I wouldn't. By 6pm when I arrived for the VIP "session", I was certain that it would be an ambitious culinary and entertaining event. And this was the case. I started with Fette Sau’s smoked pork belly plate, a pure delight for a carnivore and then strolled towards Xie Xie’s braised pork with tart shallots, another delightful experience. I skipped Fort Defiance’s deviled eggs with pickled mustard seeds and smoked black peppers (732 of which were given away to the foodies of the event) and looked for more extreme gastronomic experiences. I expected more from Vanderbilt's duck pate with confit gizzard, I liked Mooncake Foods spicy thai salad, grilled chicken and buckwheat noodles with cilantro mint pesto and for the first time I tried the world-known South African street food -the bunny chow (a crusty bread filled with lamb-curry, hunks of potato and mango chutney) courtesy of Bunny Chow. I also experienced the unique spicy cold noodles of Xi’an Famous Foods. But my congratulations will go to the Bao Haus signature bao -the Niman Ranch Skirtsteak bao served with crushed peanut, cilantro, haus relish and Taiwanese red sugar. Yes, the long line was worth the wait! A great thank you to the Village Voice Choice Eats: thank you because you gave us the chance to taste unique foods -with an Asian focus-of restaurants that not easily accessible. Now I know that New York is definitely one of the most interesting culinary cities in the world, offering not only pizza but even bunny chow. Many associate wines with their country of origin and as such with the local foods and dishes. A nice Chianti is always associated with pasta arrabbiata and Prosecco with antipasti but Riesling can only go with German cheese and sausages. But the versatile taste of wines can easily be matched with international cuisines and dishes from all over the world. Greek wines originate in South Eastern Mediterranean region. A large variety of grapes are produced in the islands of Santorini, Cephalonia, Lemnos, Rhodes and Crete but also in mainland areas as Nemea (Peloponnese), Mantinia (Peloponnese) and Naousa (Macedonia). But how would you pair them to impress not only your friends or guests but also to please your palate? Here are some ideas for the table. Assyrtiko, the top quality vine originated in Santorini is a grape that produces age-worthy white wines of honeysuckle and citric aromas with good acidity. It pairs perfectly with grilled sea-food like shrimps, muscles and calamari but also more oily fish like salmon (Assyrtiko, Domaine Porto Carras 2009, Assyrtiko Argyros 2008, Estate Argyros 2007, Assyrtiko 2008 Ktima Pavlidis). Malagousia is the new type of Assyrtiko. With peach and nectarine aromas is of medium acidity, fresh, light and crispy. It is the perfect wine for aperitifs and starters and pairs nicely with numerous dishes of Mediterranean specialties (Malagousia 2008, Domaine Porto Carras). Moschofilero is a thick-skinned grape that is used to make very aromatic whites and roses. It is the only grape allowed in the OPAP region of Mantinia in the Peloponnese. It is paired beautifully with spicy Asian cuisine. Try it with a Thai spicy beef salad, Thai spicy noodles or Malaysian chicken satay (Mantinia 2008, Domaine Spiropoulos). Xinomavro is the most common red grape planted in Greece; its name literally means “acid black”. The wines, when young, can be harsh but age very well. They also tend to be soft and spicy with good acidity. They can be aromatic fresh whites, aromatic or sparkling roses but also strong reds, good with roasted red meat and rich sauces. When aged, it is suitable for fatty French cuisine but also for dishes of the Basque region (Uranos 2007, Thimiopoulos Vineyards). 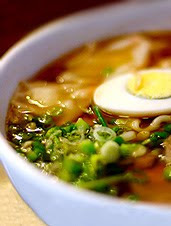 It may well be one of the Asian comfort foods – ramen for a cold wintery day or even for a relaxing spring lunch. This type of noodle soup, recently named the most sophisticated and advanced type of noodles by Noodle Road fim producer Wook Jung Lee , is often mixed with veggies, chicken or fish and broth. Now when you add a cup of sake to all this, it becomes far more relaxing, tasty and a good reason to resort daily to the Asian specialty. Yushi midtown is the inventor of this novelty. It’s a combination of dashi-based broth, made with a blend of bonito, Nanburyu sake, mirin and low sodium soy sauce perfectly blended together with ramen noodles, teriyaki chicken, freshly grated ginger, broccolini, scallion and topped with a soft boiled egg. Otherwise, the perfect excuse to give up your boring bagel or burger lunch. Yushi expects you at the counter, you show your ID card and then take a seat and enjoy your alcoholic ramen. If you are brave enough, go for the super sake ramen, which contains a full cup of sake. Who says that lunch has to be alcohol free? Brits definitely can talk about it. Now, it's the time of New Yorkers in a Pan-Asian tapas place at mid-town. Jansen Chan is Oceana's pastry Chef. He accepted to share with me and you his culinary secrets, sugary preferences and his top restaurant in the world. 1. 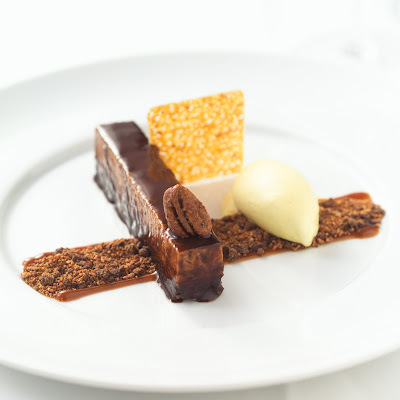 When did you find out that you wanted to become a pastry chef? 2. What’s your favorite dessert from Oceana? We change the desserts often at Oceana, so it’s hard to pick one. I had a particular fondness for Banana Semifreddo, Sticky Rice, and Milk Jam. I love rice and I got to incorporate it in a dessert not as a pudding finally. The best clients are ones who are really open minded about food. I like to change people’s perceptions of a certain foods or flavors and surprise them in a positive way. 4. What have you been serving this winter? Since I stay seasonal, the usual suspects of citrus and tropical fruits. In particular, I am very fond of chocolate and lemon combinations. 5. What is your culinary secret? Stay healthy mentally and physically. It’s long hours. 6. Any particular favorite tastes? I really like a nice balance of acidity to sweetness in both savory and sweet foods. All foods should be balanced -- it brings out the flavors of the food. 8. Three favorite must-haves in your cupboards are: salt, sugar, and eggs. 10. Your next step will be: to… keep making great desserts. 11. And finally, what is your favorite gastronomic destination? Any Alain Ducasse restaurant in the world. Chocolate lovers should be celebrating today as the 0-calorie chocolate is available in the market for purchase. But on one condition, chocoholics: You can only breathe it, not chew it. In a low-key thus cozy and friendly event in Dylan's Candy Store, invented by Harvard Professor David Edwards, Le Whif was presented to the media, industry experts and chocolate lovers. But how this strange, little lipstick-like device works? It is simple. To use Le Whif, take a quick puff from the device and particles of chocolate are directed through the air via small holes in the mouthpiece, landing on one's tongue and the sides of their mouth, resulting in the unique taste sensation. Le Whif uses particle engineering to form chocolate in microscopic sizes that are small enough to become airborne, though too large to enter the lungs (one Le Whif Chocolate insert pack contains 300mg of pure chocolate). Le Whif Chocolate is available in three organic flavors, including chocolate, raspberry/chocolate and mint/chocolate. And for the record, each device delivers 8-10puffs. And if Le Whif Chocolate is too good to be truth, there is also Le Whif coffee that works in the same way containing the equivalent of a single shot of espresso. But who is the target audience of Le Whif product? "Women of 18-40, followed by children" said Edwards. "I also think that diabetics will use it as well". As one of the party launch attendees, I "tasted" the chocolate and chocolate/raspberry flavors. My opinion? Definitely unique and easy to use; I would add more points for the innovative, colorful design of the device. But on a second note, the taste of melting chocolate in my mouth is unbeatable. I have no intention to pretend being like Proust describing sensations while eating his favorite “madelaines”. But for a 21st century blogger, chocolate can have the same effect: it often "carries" feelings and brings memories. Can Le Whif do it? I missed Le Whif Coffee but this is for another time. The Village Voice's Third Annual Choice Eats Tasting Event is less than two weeks away and a record breaking 64 restaurants have been confirmed to participate. The event will be held at the 69th Armory on Lexington Avenue on March 22. New additions to this year's line up, include: AM-Thai Chili Basil Kitchen, Krik Krak, Juliette, Resto, Café Glechik, Peppa's Jerk Chicken, Bunny Chow, Sigmund Pretzel Shop, Xunta Tapas Bar, Salumeria Rosi, Jimmy's No. 43, Xi'an Famous Foods, Lucy's Whey, Counter, An Choi, and Café Steinhof. Luke's Lobster: Bite-Sized Shrimp Rolls: fresh, sustainable Maine shrimp in a buttered and toasted bun with a squirt of mayo, a bit of lemon butter, and a dash of secret spices. Dirt Candy: Pumpkin Crostini with Maple Smoked Butternut Squash and Roasted Pepitas (Vegetarian). Congee Village Restaurant & Bar: House Special Fried Pork Ribs, Shrimp with Walnut & Broccoli in Mayonnaise. Del Posto: Chocolate and Olive Oil Bastoncino, Olive Oil Gelato Lollipops Coated in Chocolate with Salted Breadcrumbs. Zuzu Ramen: Fricasse of skate, squid, and kimchi with iceberg lettuce, nori tapenade, citrus aioli, and pork cracklin. Motorino: Insalata di Polpo (octopus, potatoes, celery, capers, extra virgin olive oil, lemon). Café Steinhof: Austrian beef Gulash with Spaetzle. The Vanderbilt: duck pate with confit gizzard. Mooncake Foods: Spicy thai salad, grilled chicken and buckwheat noodles with cilantro mint pesto. Other highlights of the event include Brooklyn two brother DJs, Finger on the Pulse as this year's official Choice Eats DJ. The International Restaurant and Foodservice Show ended last Tuesday at 4pm. It opened its doors on Sunday morning with plenty of foodservice industry experts, press, buyers and consumers visiting - creating a buzzy atmosphere and crowded aisles and lines in front of popular foods! Definitely smaller than the Fancy Food Show (which is more of specialty foods show), this one focuses on restaurants and foodservice professionals and on Japanese Food and Beverages. Interesting events are the Ultimate Barista Challenge, the famous US pastry competition and the New York Pizza showcase. What were the most impressive and maybe, weird items? The weirdest and probably the most unique is the Canned Bread. 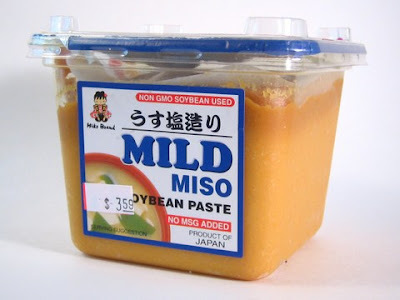 It comes from Japan, is not yet available in the US market, and their manufacturer claims that the bread can "live" in the can for over 3 years with enormous potential! The company - Akimoto Confectionery- says that the "can" has flown in the space shuttle, was donated to 100,000 cans to hungry and disaster victims and was taken on expeditions. Another product that is definitely unique is the Wild Hibiscus Flowers in syrup . It tastes like a spoonful sweet from Greece and it is, indeed, very different. I also tasted the interesting combination of the cocoa and cinnamon chili from the Manhattan Chili Company. Their Numero Uno (medium hot) Cup or Bowl contains all natural coarse ground beef, kidney beans, plum tomatoes, cinnamon, cocoa & toasted cumin. It is a little sweet and a little hot. A new beverage that will soon enter the US market is the Fresh Ginger Giner, in three flavors. I tasted, it passed the test and it is very ginger-y! Other interesting, at least for Western foodies, are the Japanese Okonomi Yaki, a "pizza" or rather a pancake from Japan. Peanuts coated with miso, peanut miso and pickled melon were a few others that deserve to be announced here. 3. MANY coffee companies with the cookie dough frappe (from Enlightened Beverages) the being my favorite. I love iced coffee! And surprisingly enough, there was no popcorn or chips exhibitors. How come?